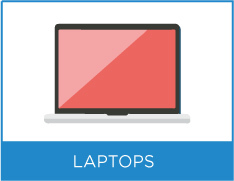 Buying a refurbished laptop is a great way to save money on the ideal device for you. There’s a range of refurbished laptops on our site that you can choose from, from leading manufacturers such as Acer, ASUS, Medion and HP. We also have refurbished laptops with different features and processors so you can find the right one for you. Looking to upgrade your smartphone? We have a variety of refurbished mobiles or refurbished smartphones that you can choose from. 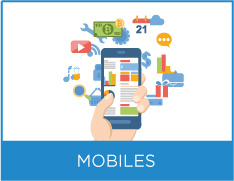 We have refurbished mobiles from leading manufacturers such as Apple, LG, Microsoft and Motorola. 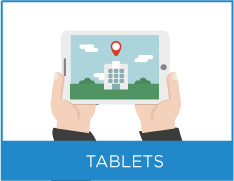 If you’re after a tablet then take a look at our range of refurbished tablets. Tablets are great for on the go, and we have a range of refurbished tablets from leading manufacturers. 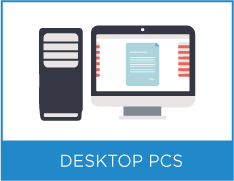 Need a desktop PC for home or work? Find a budget friendly refurbished desktop PC that suits you. We have refurbished desktop PCs from a range of leading manufacturers including HP, Lenovo and Fujitsu. Looking to enhance your viewer experience? 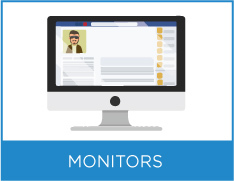 Check out our range of refurbished monitors. 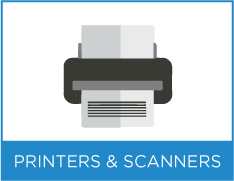 We have refurbished monitors and TVs from many manufacturers such as Samsung and HP. 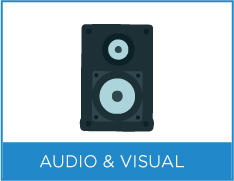 Some manufacturers have their own warranties as displayed on product pages. 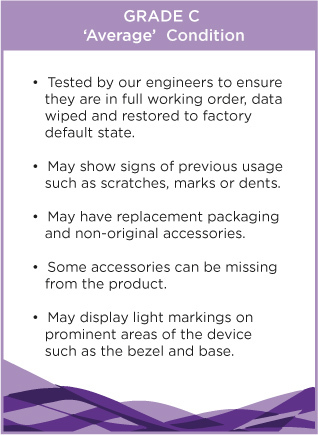 Most of our refurbished products come directly from manufacturers with seals intact, although a small percentage are refurbished by our team of engineers who test and restore products back to the factory settings. 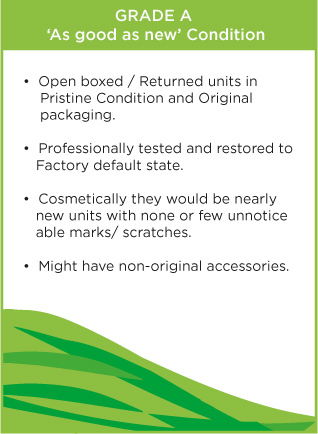 Our refurbished products are classified in 3 grades based on their cosmetic condition as explained in detail below. Product prices vary according to grades. Open boxed / Returned units in Pristine Condition and Original packaging. Professionally tested and restored to Factory default state. Cosmetically they would be nearly new units with none or few unnoticeable marks/ scratches. 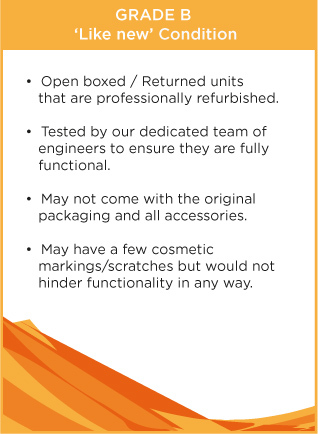 Open boxed / Returned units that are professionally refurbished. Tested by our dedicated team of engineers to ensure they are fully functional. May not come with the original packaging and all accessories. May have a few cosmetic markings/scratches but would not hinder functionality in any way. Tested by our engineers to ensure they are in full working order, data wiped and restored to factory default state. May show signs of previous usage such as scratches, marks or dents. May have replacement packaging and non-original accessories. 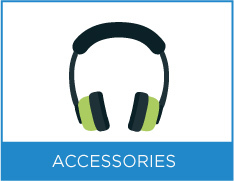 Some accessories can be missing from the product. May display light markings on prominent areas of the device such as the bezel and base.